A little creative thinking, a planning committee, and a pair of talented students turned routine repainting in the College of Pharmacy into a work of art. When OSU Facilities Services painter Charles Vail and his manager, Joe Majeski, were discussing the need for an interior repainting for the Pharmacy Building, they wondered if they could achieve their department’s mission: “to wow” with something as routine as that. “When we got to the west entrance, we noticed a beautiful frame with nothing in it,” Vail says. “That led to a ‘what if’ and ‘why not’ discussion of the possibility of murals.” Majeski gave the go-ahead and the idea was off and running. 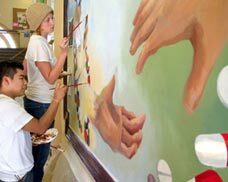 Vail located an art student, Emidio Lopez and contacted the art department where he found another student, Kim Smith, interested in working on the project. A committee, led by pharmacy professor Lee Strandberg, developed a plan for the murals to depict the past and the future of pharmacy. With the help of Kay Cooke, director of external relations in Pharmacy, things moved rapidly. Miller Paint Company donated the paint, Facilities Services provided the scaffolding, the College of Pharmacy gave Emidio and Kim a stipend, and the art department agreed to give the students project credit for their creative efforts. “This has truly been a team effort,” says Vail. The unveiling of the murals took place during the homecoming celebration on October 23. Posted in OSU People and Programs, Students and Campus Life, The Arts.